For stories where four or more characters from Star Trek: The Next Generation feature. Summary: While on a mission that many of the Enterprise crew believe to be a First Contact encounter, the away team, comprised of Cdr. Riker, Data, and Lt. Yar, meet a seemingly primitive race, the Telavians, who claim their arrival is the result of an ancient prophecy. But as they become more acquainted with the natives, they discover the prophecy is actually a conspiracy to exploit the Federation, and that there is more to the Telavians than meets the eye. Can Flint and Picard prevent an android civil war?? 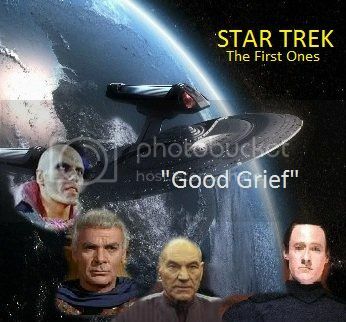 STAR TREK THE FIRST ONES...Lore has returned and now he has an army of androids...but there is another android force out there that is even bigger and it threatens the galaxy...and beyond!! Summary: Robert Canary didn't plan for adventure...but does that really matter? Summary: in an alternate reality Doctor Beverly Howard and Commander Elizabeth Shelby face the ultimate test during the Klingon War. Summary: Captain Picard is retiring, leaving Will Riker in command. But before he rides off into the sunset, taking Dr. Beverly Crusher with him, the Enterprise crew encounters a strange man named - Gene Roddenberry? When forced to choose between the almost certain conquest of the Federation and a disease that could end all human civilization, the director of Cold Station One gambles, and gambles big. Summary: Commander Worf and the Borg Homunculus remain trapped within the storage cube as Fleet Captain Picard is dispatched on an urgent mission to Epsilon Eridani. Summary: Dr. Crusher suddenly finds a bleeding military man on the floor of her sickbay. Of course, Q turns up and tells Picard the battle is on again.. for humanity's existence. Summary: Help the crew of the Enterprise-D with their "technobabble" as the encounter strange anomalies and enemy ships!